About 1 month ago I implemented Rel = Author on this site, and thought I should share the method with you. You may ask, what is Rel = Author? Rel Author is a way for you to distinguish to the web, Google and other Search Engines who is the author of a particular piece of content. Sometimes you may run a Google web search and see peoples faces in the Google Search results, with a Link back to their Google Plus profile. This obviously looks professional and personalises the internet, something I think is important. It also shows users who is the author behind the content, which in my opinion makes the user more likely to view your website. So how do you implement Rel = Author? Today I will discuss the simple way to setup Rel = Author on your website (Next week I will discuss the advanced way). If you don’t have a Google Plus profile, signup here. Goto the page where you would like to mark yourself as the author (obviously you need to be the website owner/ writer etc). The HTML code for this link is: <a href=”https://plus.google.com/118077431465872596261? Replace my Google Plus URL and Name with yours. Google Plus has a links section on the About Tab of your profile. Add your link here pointing back to the Main website URL. Next thing you need to do is +1 that particular page you have added Rel = Author, or +1 the homepage URL. 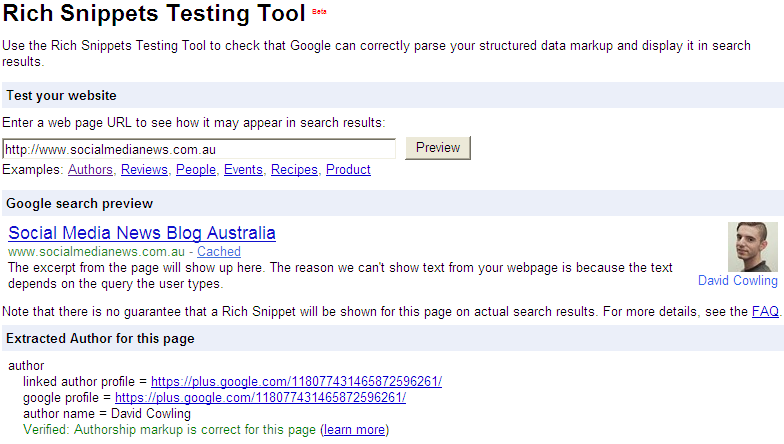 Goto: http://www.google.com/webmasters/tools/richsnippets and type in the URL and check it validates correctly. If you are the owner of the website and want Google to recognise every page as your content, add this Rel = Author link (as per point 2) on every page of your website. An easy place to do this is in the header, sidebar or footer. You can see my Rel = Author link in my footer on every page. Tell Google you have done this by Filling out this form. Unfortunately I can’t see my photo in the search results yet. I am hoping Google will add my photo soon because I think this will attract more users (Because I am so pretty, and it looks smart). I have emailed Google but haven’t received a response yet. But I am not too worried as it doesn’t seem any .com.au websites have Google Plus profile pictures showing in search results. But I think it’s still a good idea to implement as Google will make this option available soon. If you have any questions or need help implementing, let me know.